Jordan Brand continues to turn heads with their impressive lineup of Air Jordan 2012 Lite. They are about to add another stunning edition with the release of a new colorway of the kick. Anytime from now, Jordan Brand will be releasing the Air Jordan 2012 Lite “Hulk”, which, as the name suggests, is inspired by the famous Marvel character Incredible Hulk. 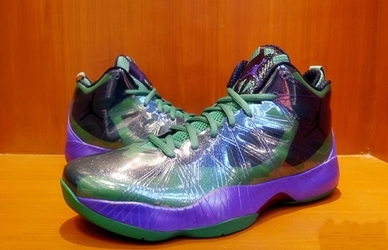 This new edition of the Air Jordan 2012 Lite sports a green Hyperfuse upper part accented with purple touches throughout the silhouette. With the popularity of the fictional character it was themed from; expect this one to make waves once it hit the market. No release date has been announced, but words suggest that this one will is coming out very soon!